The Grape Solar 100-Watt Off-Grid Solar Panel Kit is ideal for a variety of DC applications, including RVs, boats, 12 Volt battery charging, small pumps, and LED lights. Made with high efficiency crystalline solar cells for years of service, this solar kit is easy to install and virtually maintenance free. An anodized aluminum frame and a sealed junction box make the panel weatherproof for outdoor use. A two diode bypass minimizes power drop caused by shade. You can easily add additional panels for more power. This system will provide approximately 300 Watt Hours or 25 Amp Hours of charge per day. The kit includes: 1pc 100-Watt Mono crystalline solar panel a 30 Amp digital charge controller, cables and manual. The Grape Solar 400W Off-Grid Solar Panel Kit is ideal for a variety of applications, including RVs, boats, 12V battery charging, small pumps, charging small electronic devices and operating LED lights. Made with high efficiency crystalline solar cells for years of service, this solar kit is easy to install and virtually maintenance free. An anodized aluminum frame and a sealed junction box make the panel weatherproof for outdoor use. This system will provide approximately 1,200W Hours or 100 amp Hours of charge per average day. The kit includes: 4pc Grape Solar GS-Star-100W 100W polycrystalline solar panels, a 35 amp Xantrex PWM charge controller, 1,800W Xantrex inverter with two outlets and 1 USB port, cables and manual. The Master Flow 500 CFM Solar-Powered Roof-Mount Exhaust Fan will help remove excess heat and moisture from your attic to protect your roofing system from premature deterioration. The Solar Powered fan requires no wiring, uses no electricity, and works with your existing intake vents to help lower the temperature in your attic. The 24V DC brushless motor provides airflow up to 500 CFM and requires no maintenance. The impact resistant, 10W solar panel has a tilt and swivel design to provide ideal sun exposure. Recommended usage for this unit is one unit per 800 sq. ft. of attic space with a minimum intake ventilation of 240 sq.-inch of net free area. 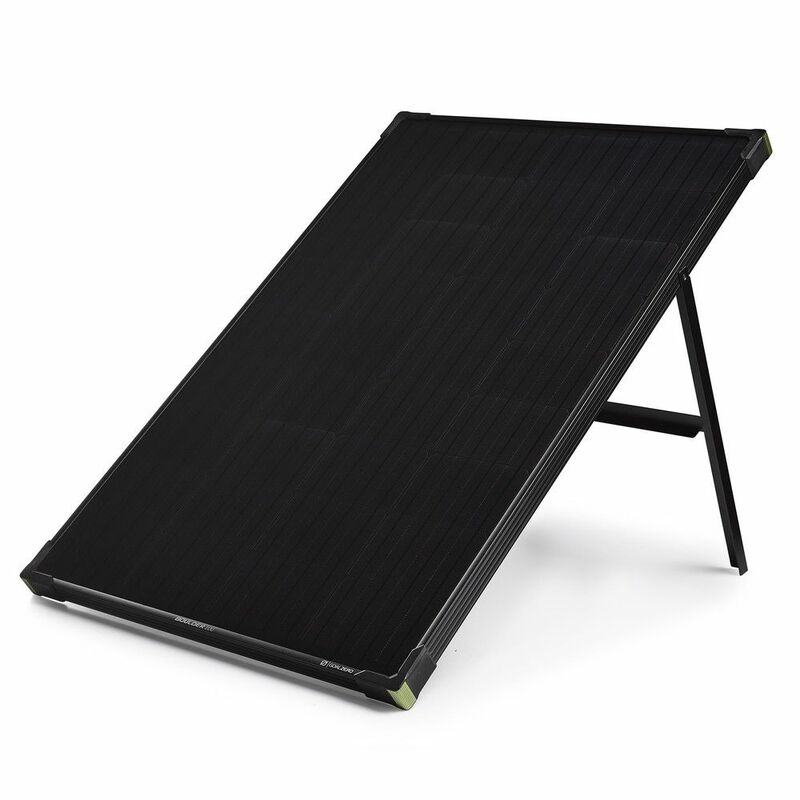 Boulder 100 Solar Panel Rugged, durable, and rigid. The Boulder 100 Solar Panel is built with strong tempered glass and an aluminum frame with added corner protection for temporary or permanent installation. Equipped with an integrated kickstand to help get optimal angle to the sun. Use with a Goal Zero portable power pack or portable power station to charge your gear day or night.